Water soluble oil paints offer an alternative for the artist who wishes to explore oil colors without having to use solvents. Various reasons might be allergies, painting in a small space or simply an aversion to the smell. With this in mind, oil paint manufacturers have found a way of making the oil in the paint soluble with water. With this new product, their associated oil mediums have been developed. Harsh solvents may never be used. But what are all these mediums for? Linseed oil, stand oil, drying oil, thickened oil, refined oil, poppy oil and safflower oil, all have their water-based equivalents for water-soluble oil paints. These can be cleaned and thinned with water or (if preferred) a water-based solvent. Now that other paint manufacturers have cottoned on, the artist can find water soluble oil paint ranges from Royal Talens’ Cobra range, W & N’s Artisan, Reeves and Duo Aqua Oil. With this in mind, how can these various mediums for water-based paints be used? 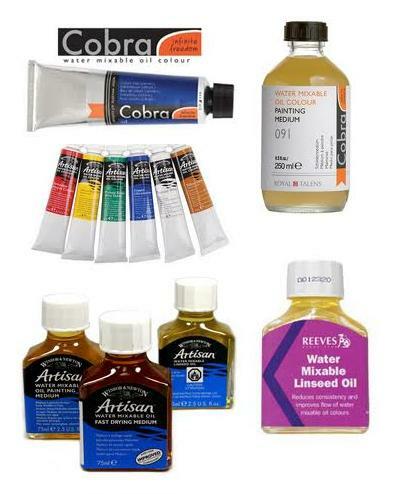 This medium is the waterbased equivalent to the most popular oil medium used by artists. Linseed oil is slow drying, adds gloss and translucency to the paint. It is also good for detailed work as it improves flow. As watersoluble linseed oil is the chief carrier of the watercoluble oil paint anyway, adding more to the paint mixture is rather like adding water to watercolor. Linseed oil tends to yellow slightly with age, so safflower oil is used for pale colors such as titanium white. As mentioned above, linseed oil tends to yellow slightly with age, which might not be desirable for pale colors. Safflower oil is lighter in texture and in color. It is also resistant to yellowing, making it the ideal medium for a painting with lots of pale colors. Again, safflower oil increases gloss, transparency and flow. This oil dries to a tough, durable finish rather like enamel. It is also slow drying and leaves a glossy finish. This makes stand oil ideal for the artist who wishes to deliberate over a painting over a series of days. If high detail is the aim, stand oil will make the paint flow and flatten out brush marks. 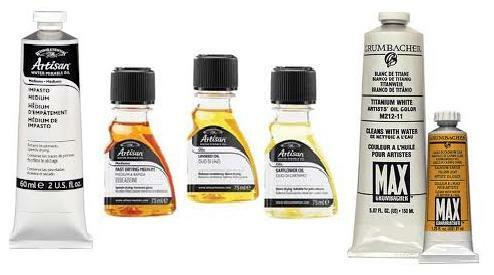 This water soluble oily medium can be added to the water based oil paint to speed its drying time. It is ideal for glazing techniques, adding transparency and flow. This makes the paint easier to handle for detailed work and ridding of brushmarks for smooth effects. As it dries quickly, a second glaze of oil paint can be added in just a few days or so. This medium is non-yellowing, so is ideal for pale colors. It is often used for oiling out, a means of nourishing the oil paint if it has dried dull. This can happen if the painting has been applied onto an absorbent surface or if the paint has been overly thinned with water. Once the painting is dry, dab the oil onto the dull patches with a clean cloth. Repeat if the patches reappear. This oil is slow drying and adds transparency to the paint. If this medium is not at hand, linseed oil will serve just as well. As mentioned above, water mixable oil paints dispenses with the need for solvents, as the paint can be thinned and cleaned with water. However, using water alone as a solvent can cause the moisture in the paint to evaporate quickly and create an emulsion-like film on the paint on the palette prematurely. This thinner keeps the paint moist and workable for longer. It also retards this ‘film’ from forming too soon. This medium is not strictly an oil medium, but an alkyd; but as it is also used with traditional oil paints, deserves a mention here. Impasto medium accelerates the drying time of the oil paint and bulks up the paint-body, making impasto techniques possible, as well as Sgraffito and palette knife application. Brownish in color, impasto medium will not affect the oil paint’s color once mixed in. Use no more than 1 parts to 4 in the oil color. Which Water Soluble Oil Should I Use for Painting? Just like traditional oils, there is an array of oil mediums that can be thinned with water for water-soluble oils such as Artisan or Cobra. Stand oil, drying oil and linseed oil, not to mention alkyds have their own watermixable counterparts. But the artist does not have to possess all these oils. In fact, I would recommend thinner, linseed oil and impasto medium for water soluble paints for starters. With these, you can explore glazing, impasto and alla prima techniques. Bear in mind that using traditional oil painting mediums with water-soluble paints will make them more water-resistant, so to enjoy the benefits of water-soluble oil paints, it is worth sticking to the water-soluble oil mediums. Hi Rachel, thanks so much for your helpful article. I've just invested in some water oil paints and your article told me everything I needed to know about which mediums to use with them. Thanks so much again, Victoria.